Telecast Fiber Systems announced the launch of the Terrapin FTR-D6, a 3Gb/s fiber optic video transceiver that also incorporates a six-output distribution amplifier. With four modes of operation, the Terrapin is a compact, bidirectional throw-down device that is ideal for distributing an HD video signal to several locations within a large venue. "In a typical live OB production such as a sports or entertainment event, production team members such as lighting directors, sound engineers, and producers are scattered throughout the venue — and all of them need to be able to monitor the main video feed," said Steve DeFrancesco, vice president and general manager, Telecast Fiber Systems. "The Terrapin is the perfect solution for this type of production, offering an extremely easy-to-use and low-cost solution that harnesses the light weight and distance-spanning capabilities of fiber." The new Terrapin FTR-D6 features both a fiber optic (ST) input and a copper (BNC) input, as well as a fiber optic output (ST) and six copper (BNC) outputs. A single push-button operation makes it easy to switch among four modes. The first mode enables the Terrapin to act as an HD/SDI distribution amplifier with six BNC outputs and an ST output. Mode 2 supports a typical "tap and drop" installation in which the Terrapin is used as a receiver and retransmitter to feed six different monitor locations. Mode 2 also supplies a fiber output to reclock and regenerate the signal to another location, where an additional Terrapin can be added to feed six additional monitors. In this manner, any number of Terrapins can be added to support a large production with no degradation in signal quality. In Mode 3, the Terrapin acts as a transceiver to receive a signal from a distant location and then transmit it via the six BNC outputs. Finally, Mode 4 is a pure SDI distribution amplifier and fiber booster, enabling the Terrapin to provide multiple outputs from a single BNC signal. 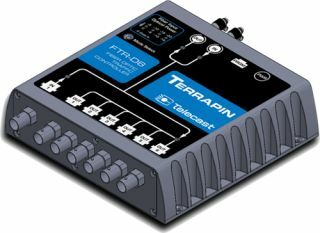 The Terrapin FTR-D6 will be among several new Telecast Fiber Systems innovations for fiber optic transport on display in the company's booth C8925 at the 2012 NAB Show.